With the new University year starting it’s time to take fool proof, quick and easy make-up seriously. There’s genuinely nothing worse than having a make-up mishap when you’re in a rush or already running late. Cream eye-shadows are possibly the most quickest yet most effective make-up product, you only have to use a touch of the product for it to be really opaque, it’s such a time saver. 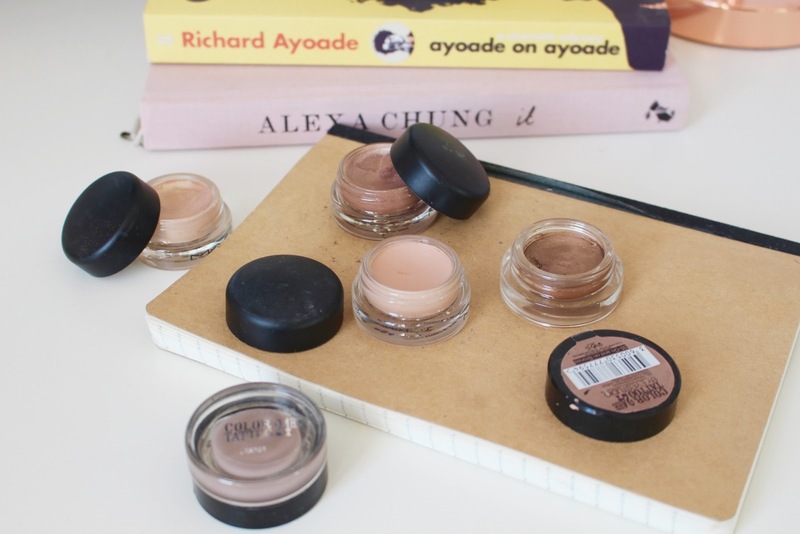 Maybeline do some really good budget cream eyeshadows, if you’ve never ventured into cream eyeshadow before, I would highly recommend the Maybeline Colour Tattoos. They have a wide range of colours to suit any look that you’re going for My two favourites are the more natural,wearable colours as it’s very rare that I go overly bold when it comes to eyeshadow. Bronze on Bronze is really highly pigmented, I use it as a base shadow and add a warm tone matte brown into the crease and that’s it. With Permeant taupe I do pretty much the same, however I add a hint of a chocolate brown eyeshadow into the crease. Now onto the higher-end cream eyeshadows. I genuinely cannot recommend the Mac Paint Pots enough. Like the Maybeline colour tattoos, they’re highly pigmented and come in a range of both matte and shimmery shades. However I’d say that the Mac Pain Pots are so much more creamy. However they’re almost double the price. Vintage selection is perfect as a base coat, preferably on a night out when you want a fuss-free eyeshadow, but still want it to look like you’ve made an effort. Bare Study and Painterly are my holy grail day-to-day cream eyeshadows. I used Painterly almost everyday, It covers up any veins on your eye-lids, due to my skin being ridiculously pale this is something that is crucial to an eyeshadow base. Bare study I use over skin-toned or light brown eyeshadows in order to add a slight shimmer without over doing it for the daytime. These cream eyeshadows are versatile and can pretty much be worn for every occasion. What’s better than looking like you’ve made an effort with you put in minimal effort really? Excellent collection of cream eyeshadow. I have something similar to this. I am delighted!! !